Continued from Stage 12 - page 1. Cross the bridge over the motorway and follow the road for about 2 kilometres until you come to the railway line which runs parallel to the road. The road bends and you will see a rubbish tip on your left and a bridge over the railway. Cross the bridge and from here you can either follow the road until it joins the N1 or take a slight detour to visit la Iglesia de Villafria with its resident storks. There are a couple of bars near the church should you wish to have a drink. Going back to the main road follow the N1 towards Burgos and after about 4 to 5 kilometres you come to a large crossing and at this point the road becomes Calle Vitoria. A little further on you come to another junction which is signposted right towards Santander, left to go to Madrid and the centre towards Burgos city centre. At this point we would recommend that you continue down Calle Vitoria but taking the shaded road running parallel to it on your left which takes you along the river and down the Avenida General Sanjurio. Eventually this road leads you to the pedestrianised area known as Paseo de Espolón in the city centre close to the cathedral. After you have crossed the bridge over the A1 motorway turn left past the former barracks, then take a right onto a track through some wheat fields and waste ground. The path is way marked but because the authorities have had no option but to paint them on the ground they may be difficult to see. As an alternative guide look out for 2 large chimneys in the distance. One is coloured red and the other white, the spire of the cathedral can be seen behind them to the left. After about 3 kilometres you pass through Casteñares and will soon meet up with the route that came from Villafria. Follow Calle Vitoria, down the Avenida General Sanjurio and into the pedestrianised area of Paseo de Espolón towards the cathedral. Burgos is a place that is worth spending a whole day in if not longer. If you are a lover of architecture or of history you will find something to suit your taste here. There are around 75 monuments in Burgos with the Monasterio de Santa Maria la Real de las Huelgas, the Cartuja de Santa Maria de Miraflores and the Catedral de Santa Maria, Burgos all well worth a visit. If you take into account the Atapuerca Man, who at over 800,000 years old is considered to be the oldest European, then Burgos could technically be considered the oldest city in Europe. The city's actual foundation comes some time in the late 9th century around the time of the Reconquista, becoming the capital of Castilla y Leon during the 11th century. Burgos flourished through the export of wool to Flanders during the 15th and 16th centuries however, by the 17th century this was in decline, primarily due to the political strife in Flanders and other towns and cities also exporting wool. 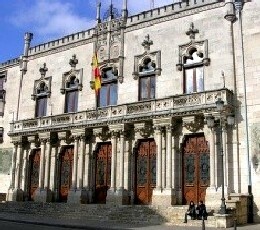 As its fortunes declined Burgos settled into the role of provincial capital. Burgos has been on the pilgrim route from the very beginning and as I've said earlier it is a place well worth spending a day, if not more in before you start on your next stretch of the journey through the flat plains of the Maseta. The old part of the city with the remains of the old castle looking down onto the Gothic Catedral de Santa Maria, declared a World Heritage Site in 1984 and the impressive gateways leading into it from the river are well worth seeing. 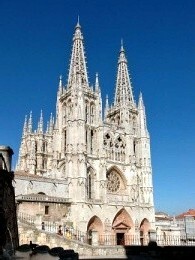 People who visit Burgos without doubt visit the cathedral. The building of the cathedral was commissioned in the 11th century by the then King Fernando III and his German wife Beatrice of Swabia. The building of the cathedral was overseen by the English born Bishop Don Mauricio. The towers which dominate the skyline were designed and built by Hans of Cologne, bearing more than a passing resemblance to the great cathedral in Cologne. Many of the sculptures within the cathedral can be attributed to the father and son team of Gil and Diego de Siloé, natives of Burgos. The cathedral is vast with a number of different chapels but perhaps one of the most interesting is the Capilla de Santisimo Cristo de Burgos. Here, behind a pane of glass can be found the figure of a crucified Christ dating back to the 14th century. Nothing unusual in that, however this wooden figure is entirely covered in buffalo hide. It also appears to have a full head of real hair and is wearing a skirt. The arms and legs are also moveable. 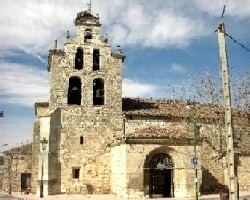 Directly opposite this chapel above the Capilla de Santa Tecla you will find another strange sight, that of Papamoscas. 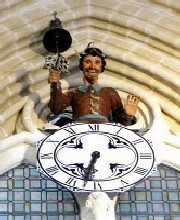 This is an automaton above a clock which opens and closes its mouth and strikes a bell on the hour, every hour. 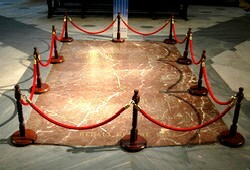 Also within the cathedral are buried the remains of Rodrigo Diaz de Vivar, better known worldwide as El Cid, and his wife Doña Jimena. Their burial place, surprisingly, is marked simply by a paving slab. When you came into the city, if you followed the route down the Avenida General Sanjurio you will have probably already entered the old town across one of the two main bridges. 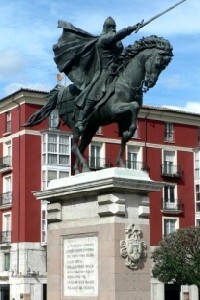 The more eastern of the two, known as the Puente de San Pablo is guarded by an imposing statue of El Cid. 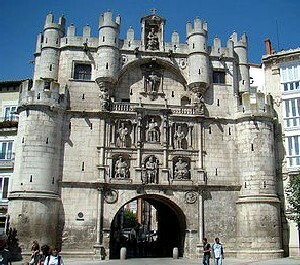 The other bridge is the Puente de Santa Maria dominated by the magnificent Arco de Santa Maria, one of the original archways of the city's ancient walls. If you have an interest in Christopher Columbus make your way to the Casa de los Condestables. It is said that the Catholic monarchs Ferdinand and Isabella received Columbus in one of the halls here after he returned from his second journey to the new world. For those of you who may have an interest in the Spanish civil war you may be interested in visiting the neo-gothic building called la Capitania. This building, still used by the army today, was used as the headquarters for the Nationalist Junta during the civil war and the façade still bears plaques to the memory of Generals Franco and Mola. Continued on Stage 12 - page 3.